8" height. Thistle design in leaf to lime greens with purple highlights. Hand thrown and painted. Signed by artists. A marvelous table vase for hand picked or store bunches. 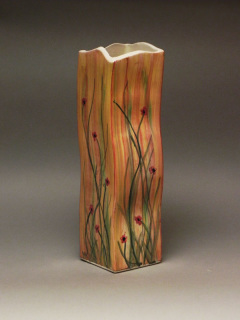 9" Vase with Cone Flower design. Lovely for the table or on a shelf. Hand thrown and hand Painted. Signed by artists. Golds, blue, purples, pinks, and yellows. 9" Vase. 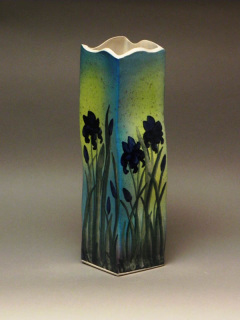 Hand thrown, hand painted with Iris design highlighted with soft yellow and blue background. Signed piece. 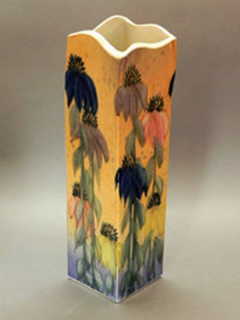 A wonderful table vase or a highlight for shelf or cabinet. 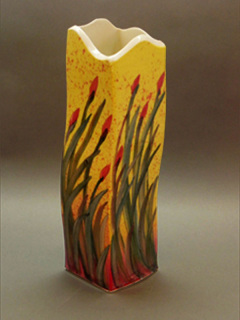 9" Vase. Signed by artists. Hand thrown, hand painted with Poppy design, highlighted with variegated colors - reds, mandarins, blues, and soft greens. 9" Vase. Hand thrown, hand painted with Thistle design, highlighted with soft greens and purples. Signed piece. 14" height. Cone Flower Design. Signed by artists. Extruded piece, altered and hand painted. Excellent for long stem flowers or just as an interesting sculptural piece. 14" height. Red Bud Design. Signed by artists. A stand alone sculptural piece or for long stem flowers. 14" height. Signed by the artists. A sculptural piece that stands alone or with those long stem flowers. Iris Design, blue and soft yellow greens in the back ground. It can stand alone or with those long stem flowers. Poppy Design, brushed back ground in reds, and soft mandarin.